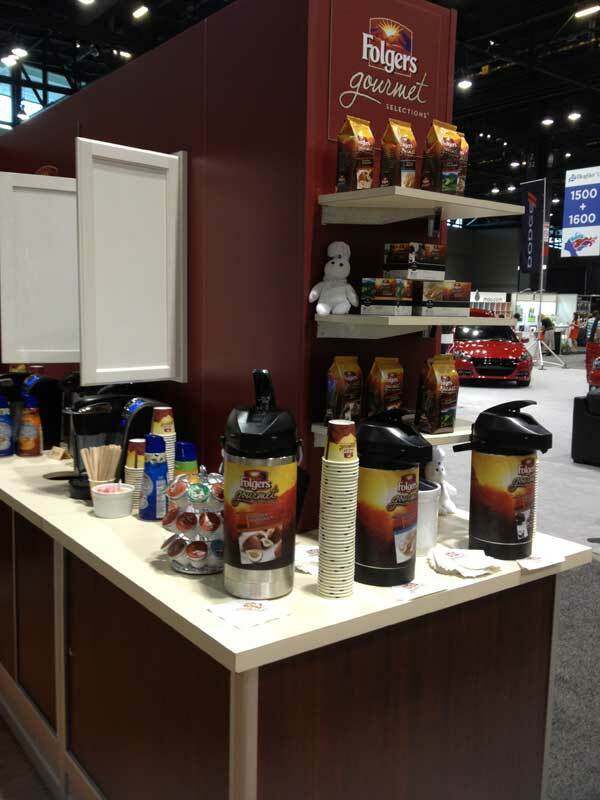 I just returned from Chicago and am looking forward to getting back in the kitchen; but first I wanted to share a few photos from the Folgers sponsored trip. I am so happy they invited me to be one of their “Bold Bloggers” at BlogHer 2013. For those of you not familiar with it, the BlogHer conference is held in a different city each year and bloggers of all levels participate in workshops and meet representatives from various brands. I wasn’t sure I’d attend this year, but my friends at Smucker’s and Folgers (they also have a Facebook page) convinced me to join them in promoting a product I use all the time. Plus my part of the deal was pretty sweet! My mission was to walk up to random people who I felt did something “bold” and give them a ticket for a prize at the Folgers lounge. While I did have to overcome my shyness and be a little bold for each encounter, every second was worth it when the people who got the tickets found out the prize was a Keurig coffee maker. And luckily, I wasn’t the only “bold” blogger. My partners in crime were Debra from A Frugal Friend, Joyce from Macaroni Kid, and Cindy from Akron Ohio Moms. They were all very nice, and we had fun comparing notes on who we handed the tickets to and why. Debra’s stories were always the best because she kept coming upon people doing very noble things. Mine were always kind of “Hey, I like those bold earrings” or “Gee, it was bold of you to pose with the Pioneer Woman” but I did manage to make a few people happy with coffee makers. The fact that our home base was the Folgers Lounge made it even more fun. 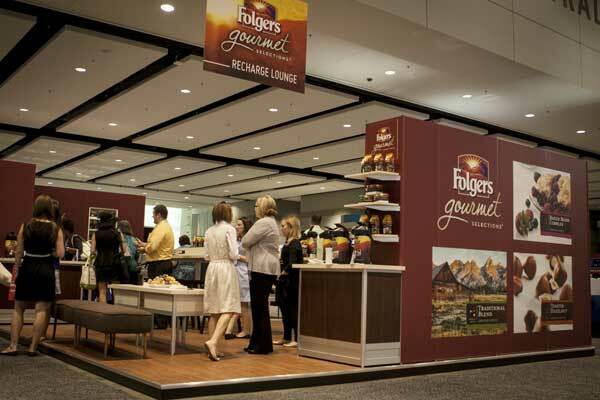 Folgers set up a life size kitchen where conference attendees could recharge their devices while sampling Folgers coffee and Pillsbury’s new “Lil’ Donuts”. My main interest was the coffee, but my traveling companion was crazy for the Lil’ Donuts. At first I attributed it to the fact I rarely make doughnuts so any doughnut was a novelty, but then I tried the Lil’ Donuts and they were actually very good. 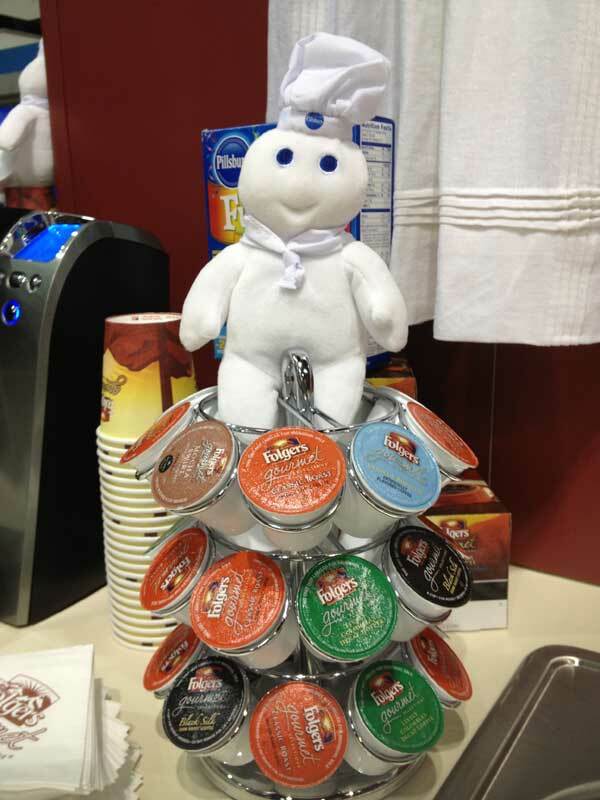 You make them using a Pillsbury baking kit which is a lot easier than making donuts from scratch and absolutely perfect for events like slumber party breakfasts — just leave the kit on the counter and let the kids make breakfast themselves. We’d start every morning of the conference by meeting in the Folgers Lounge (which felt like a real home kitchen by the end of the first day) and recharging with other bloggers before getting on with the rest of our BlogHer experience. This year I chose to partake in the expo, which is where different brands set up booths, gave away samples and introduced products. 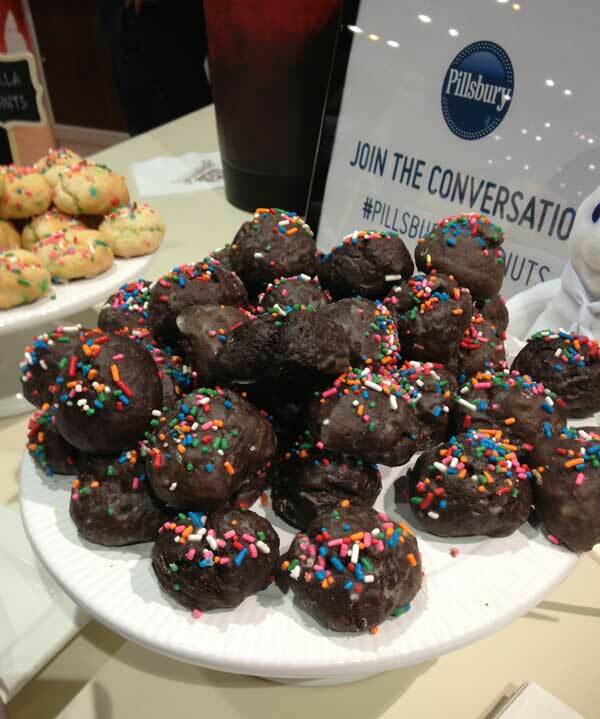 We enjoyed meeting the people with Minute Clinic and found out they had a recipe database with some good looking (and healthier) desserts and snacks. I liked the idea of tying a service I use in real life in with baking. Love with Food was another interesting company which I’m going to need to devote an entire post to because I admire their concept so much. You buy one of their very reasonably priced three, six or twelve month subscription plans, and every month they send you a box of gourmet snacks. To make a good thing much better, for every box they sell, they donate a meal to feed the hungry. What a great gift idea! Soda Stream was there, and I learned enough about the product to want to go buy one immediately. Their reps were extremely nice to Fuzz :). 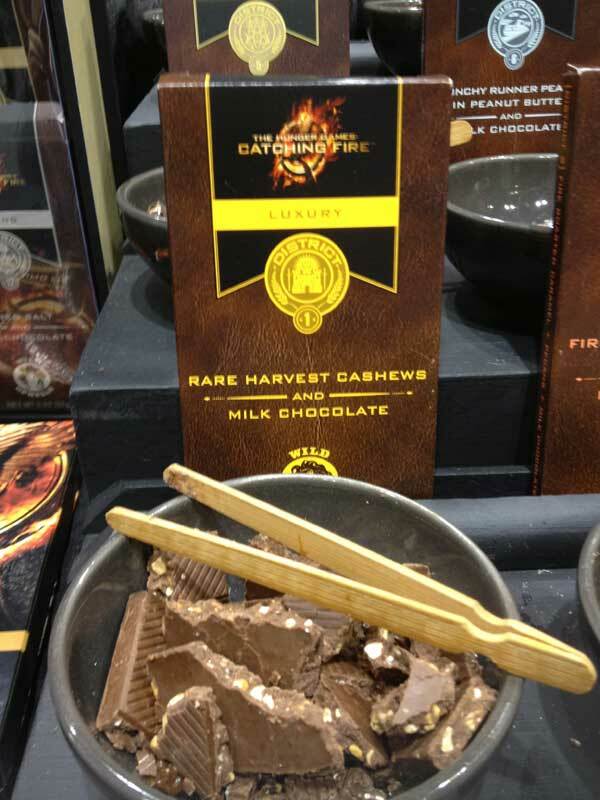 And I met the people from Wild Ophelia, who make gourmet chocolates with interesting flavors and are about to launch a Hunger Games chocolate gift pack. 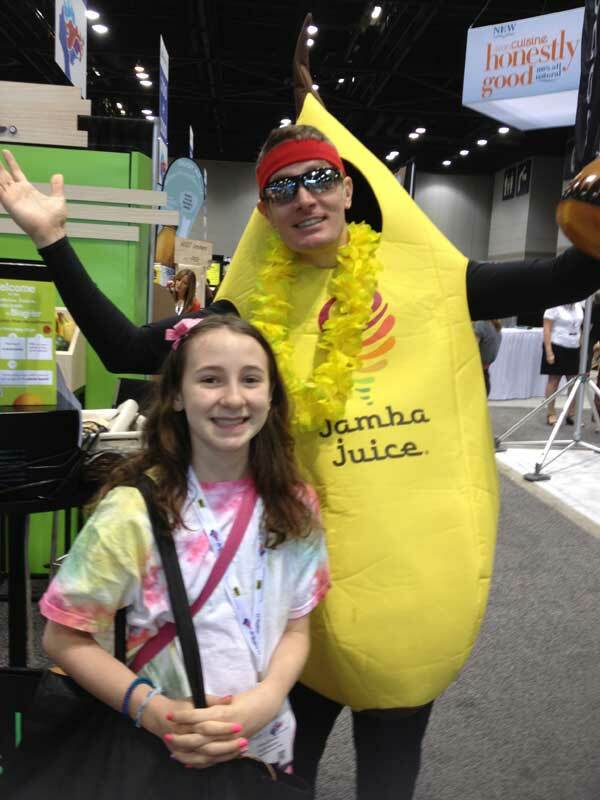 And then there were a few companies I couldn’t quite work into a baking post but wanted to mention: Jamba Juice (a personal favorite) had a friendly banana! The ladies at the Impress Press-on Manicure booth gave Fuzz a free manicure (you can see it in the above photo with banana guy) which she got compliments on all over town! I guess press on nails (something I wouldn’t know about but might have to look into) have come a long way. For those of you thinking of attending BlogHer, the conference is now so big that they had to use McCormick Place to house the expo! So even if you can’t make it to all the workshops, its worth going just for the expo alone. 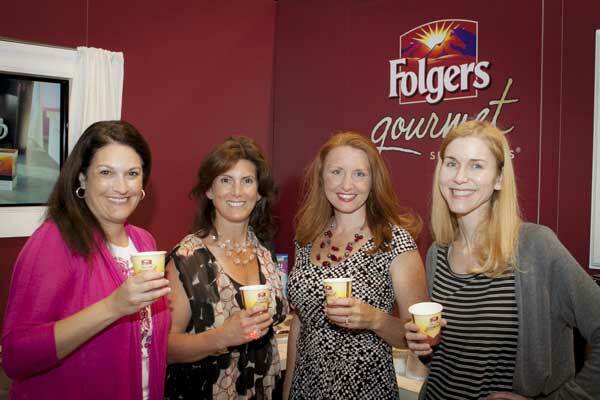 So thanks to Folgers for convincing me to go to BlogHer 2013 and to BlogHer for hosting. If you are just starting a blog of any kind, you should look into it for 2014. I think the next one is going to be in New York City. It looks like you and Fuzz had a great time! I’m tempted to start blogging again, just so I would have an excuse to attend blogher ’14 in NYC, LOL. BTW, those donuts do look good. I have never actually made homemade ones. Anna, you had the greatest ‘job’ – giving away free Keurig coffee machines. The recipients must have been ecstatic to be chosen! I bet Fuzz will want to join you again at their next conference, it seems as though she had an awesome time. Looks fun! I’ll have to go one year! Let me know when you decide to go and I’ll watch out for you! Looks like a great time Anna! One of these days I am going to make it. I know I tell myself that every year, but I really am!